We perform all aspects of pediatric dentistry here at Windsor Family Dentists without the use of oral sedation or nitrous oxide. 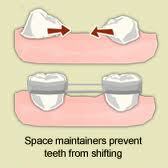 We also provide space maintainers for children who require them. We focus on patient management and building trust and confidence in our pediatric patients. Local anesthetics make the visit painless without the need for heavy medication to make a child compliant. We rely on parental cooperation for our methods to work. One of the main components of pediatric dentistry is child psychology. This manifests in a child friendly environment, direct communication styles, and teaching preventative dental hygiene habits to children and their parents in an effort to make dental visits more enjoyable.